Teach and practice executive functioning skills with these Executive Functioning Keys to Success. 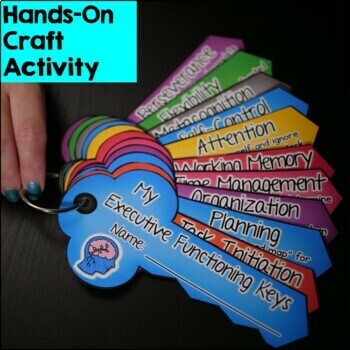 Each key represents an executive functioning skill including: planning, organization, time management, task initiation, working memory, metacognition, self-control, attention, flexibility, and perseverance. 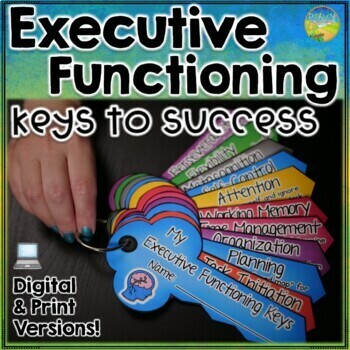 The keys include a short description of each executive functioning skill and a visual. Students will cut out and put their keys on a ring. You can hold them up as you discuss and refer to each skill in your classroom. Best of all, kids can keep their Executive Functioning Keys to Success to remind them of strategies, as needed. 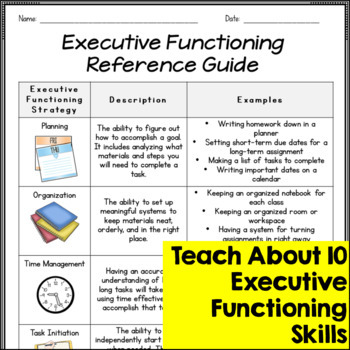 Also included: An educator guide explaining executive functioning and how to use the keys, a student worksheet discussing executive functioning skills, and an executive functioning reference guide that details each skill and gives examples. Versions are available in color and black/white for easier printing options. Target executive functioning and study skills necessary for academic success at the middle and high school level. The bundle includes over 300 pages full of lessons, templates, and workbook pages to teach study strategies and ways to improve executive functioning skills. It includes ALL of my executive functioning and study skills materials in one place. This comprehensive set of materials can be used by regular education teachers, special education teachers, intervention tutors, other support professionals, and anyone working to help students improve their study habits. These materials can also be used during advisory for middle and high school students.